The best of both worlds!!! Tampa on one side, Clearwater/St. Petetersburg on the other and the condo is located in the front building. 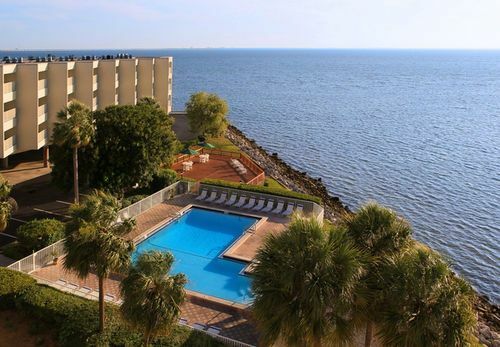 Clean fully furnished spacious condo located on beautiful one mile long Island in Tampa, overlooking the sparkling waters of Tampa Bay Shore. The 3rd floor condo is ideally situated within 5 minutes of Tampa International Airport - no airplane noise - and 2 major shopping malls with easy access to 12 minutes driving to downtown Tampa and about 22 minutes to St. Petersburg and Clearwater Beaches. Rest assured that this is one of my two private units and the view is exactly as shown in the pictures. I offer premium home , the goal is not " heads in beds " and as such the condo is not a good fit for more than 3 adults or 2 adults and 2 children. The location of the condo is convenient to all area attractions and points of interest, including Busch Gardens, Adventure Island, the Port of Tampa, Old Hyde Park Village, Westshore Business District, Stadiums, University of Tampa and Historic Ybor City. Several barbecue grills for your cooking out enjoyment, a fishing pier and outdoor fitness island awaiting your arrival. A long the Campbell Causway - Ben T Davis Beach - 45 feet above the water and 16 feet wide is a 5 mile long bridge located within one mile of the condo designed exclusively for bike riding and walking enjoyment. Enjoy the Island living within the city of Tampa! : The Condo is about 4 miles from the Tampa Westshore Mall, the International Mall, the Tampa International Airport, the Westshore Business District, and the Rocky Point Golf Course. The Condo is just one beautiful ride over the Courtney Campbell Causeway to Clearwater. It is also about 1 mile from the Tampa/Rocky Point Laser Spine Institute, 10 miles from Mac Dill Air Force Base, 5 miles from the Raymond James Stadium, 8 miles to Downtown Tampa, 16 miles to Bush Gardens, 15 miles from the Hard Rock CASINO, and about a 1 1/2 hour drive to Disney World.Enjoy the Island living within the city of Tampa! The sunset view from kitchen, living room and private balcony worth a million. Modern washer and dryer room is on the same floor a few step away. This is a great location; so close to everything yet you still have a resort feel. Will definitely stay again! Great location, beautiful views, gracious host! My fiancé and I absolutely loved it. The only thing I would have to complain about it so that there isn’t nice beach real near by but Clearwater is about 40 minutes away. The condo was nice for a couple and maybe a small family. Needs deep cleaning but it was decent. The resort was super nice and with a cool heated pool and a tiki bar. I would definitely come back. Enjoyed the resort. Staff and people were friendly. Unit was as advertised and owner was great. The location was not the best. Going anywhere in Tampa was an adventure. It was simpler to go to Clearwater for services. Resort could offer a newspaper stand. The owner was very accommodating and local so he was available immediately with any question. That is a real plus. Pool is heated and has a nice sandy area. The views are very relaxing. Great condo, centrally located to Tampa, Clearwater, and St. Petes.